The dating of this book, 1930, is deceptive, for it is very much a post-WW1 novel, and a very good one. It catches the spirit of that time, when all had lost someone and many still suffered, those so wounded mentally or physically as to be unable to take any part in post-war life, those who did go on with that life despite the mental and physical traumas. It was a horrible period. The heroine herself, Maisie Dobbs, was a nurse at Verdun, an experience from which she has never fully recovered, psychologically. She also lost her fiancé, who is still “alive” in a home somewhere, a vegetable … So when she is asked to find out whether a Flying Corps officer, officially declared dead twelve years ago after his plane crashed in France, is really dead, she accepts the task – especially as a thirteen-year-old girl whose own father was killed in the war and who is now accused of murdering her “uncle” and pimp, needs a good lawyer. Maisie’s client, the father of the missing airman, happens to be one of the best barristers in the country, and he agrees reluctantly to defend the girl if Maisie agrees to investigate the death of his son. A rich friend of Maisie’s asks her, while she’s about it, to see if she can find out anything more about her two beloved elder brothers, both killed in action. All this, of course, involves returning to France and the scenes of her nightmares. It is all very moving, very real, and very well written. And Maisie herself is a young lady you will definitely identify with, if you are anything like me. 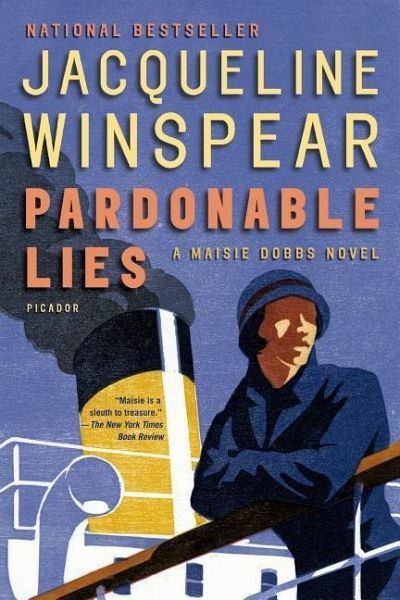 There is apparently a whole series of books featuring Maisie Dobbs out there and I’m going to be on the look-out for them from now on as I browse the shelves (and cardboard boxes) of my favourite second-hand bookshops.